Welcome to the Soft Robotics and Bionics Lab. Soft systems are a promising direction for future biomedical systems in which human-machine interactions are highly critical. The use of soft sensing and actuation materials and flexible electronics are imperative to build systems that both interact with and assist humans, as our bodies are covered with soft tissues. 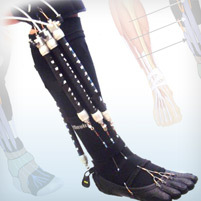 The target example systems include soft wearable rehabilitation/assistive devices, motion-sensing suits for whole body biomechanics, active soft prosthetics and orthotics, soft surgical/interventional tools, and haptic interface devices. We envisions our research being a foundation to establish a design and manufacturing methodology for developing soft robots by implementing biological sensing and actuation mechanisms. Robo-ankle appears in Discovery News (Jan. 2014), New Scientist (Jan. 2014), Engadget (Jan. 2014), Med Device Online (Feb. 2014), and Pittsburgh Post-Gazatte (Feb. 2014). Soft artificial skin appears in the IEEE Life Science (2012).